Prince Khalid Abdullah’s Juddmonte Farms has captured most of the world’s greatest races – including six runnings of the Prix de l’Arc de Triomphe (G1), seven Breeders’ Cup events, and three editions of the Epsom Derby (G1) – but the Kentucky Derby (G1) has so far remained elusive. That could change this year with a pair of well-regarded homebreds on the trail in Tacitus and Hidden Scroll. While the Juddmonte horses are invariably well named, the best prospects tend to receive the most striking names. Tacitus, invoking the ancient Roman historian, is among those fitting the pattern, as you might expect for a son of Tapit and champion racemare Close Hatches. Hidden Scroll is in the same category, as Juddmonte’s manager in North America, Garrett O’Rourke, noted. “Tacitus and Hidden Scroll were always rated highly as individuals,” O’Rourke said, “but obviously Tacitus, as Close Hatches’ first foal, was the one who garnered the most attention and ‘stallion barn’ prospects. In another point of commonality, both Tacitus and Hidden Scroll were produced by mares hailing from long-cultivated Juddmonte bloodlines. Tacitus’ dam, Close Hatches, is a thorough Juddmonte product on top and bottom. Her sire, First Defence, was a near relation to fellow homebred Empire Maker, the runner-up to Funny Cide as the favorite in the 2003 Kentucky Derby who gained revenge in the Belmont (G1). First Defence excelled over shorter distances, however, and scored his signature win in the seven-furlong Forego (G1) at Saratoga in 2008. In that respect, First Defence took after his dam, Grade 1-winning sprinter Honest Lady, herself out of Juddmonte’s prolific matron Toussaud. Close Hatches comes from another successful female line, that of Monroe. A Juddmonte acquisition, Monroe herself descended from the all-world family of Belmont vixen Rags to Riches, dual European classic star El Gran Senor, and Breeders’ Cup Mile winners Spinning World (1997) and Domedriver (2002), among a host of others as far afield as Australia and Japan. Monroe produced Juddmonte’s brilliant champion Xaar, the highweight juvenile colt in France and England in 1997. One of Xaar’s full sisters, French stakes-placed Silver Star, would go on to become the granddam of Close Hatches. Close Hatches is out of the Storm Cat mare Rising Tornado, who raced in France like her dam Silver Star. Although Rising Tornado ended up not competing in stakes, she had shown enough ability for master trainer Andre Fabre to nominate her to the French fillies’ classics. Since Rising Tornado won or placed in the vicinity of 1 1/4 miles, it made sense to begin her broodmare career by seeking a speedier mate. She accordingly visited fellow Juddmonte standard-bearer First Defence in Kentucky, and the result was Close Hatches. Trained by Hall of Famer Bill Mott, Close Hatches won her first three starts capped by the 2013 Gazelle (G2). She did not run up to her best when seventh in the Kentucky Oaks (G1), but turned the corner with a second in the Acorn (G1), and reached peak form in the second half of the season. After dominating the Mother Goose (G1) by 7 1/4 lengths and adding the Cotillion (G1), Close Hatches beat all but Beholder in the Breeders’ Cup Distaff (G1). At four, Close Hatches picked up right where she left off by compiling a four-race winning streak. She opened the season with a double at Oaklawn Park, outclassing them on the front end in both the Azeri (G2) and Apple Blossom (G1). In the Ogden Phipps (G1) on Belmont Day, Close Hatches edged Princess of Sylmar, and she rolled by five in Saratoga’s Personal Ensign (G1). Although her career ended anticlimactically with a pair of subpar efforts, the $2.7 million-earner had done enough to be honored as champion older female of 2014. Close Hatches had also earned the right to visit an elite stallion in Tapit. Aside from his obvious appeal as a sire, the Tapit mating also offered inbreeding to both Seattle Slew and Unbridled. That’s because Tapit is bred on that cross, while Close Hatches’ sire, First Defence, features the reverse cross of Unbridled over Seattle Slew. On February 21, 2016, Close Hatches delivered her first foal, a gray like his sire. Baby Tacitus naturally inspired high hopes. Close Hatches was bred back to Malibu Moon (sire of 2013 Derby hero Orb), resulting in a filly now named Atheer. But Close Hatches returned to Tapit when Tacitus was a yearling in 2017, and produced a full brother to the Derby hopeful last season. Her new foal, a Curlin colt, has the same birthday as Tacitus. Considering that Close Hatches didn’t debut until she was three, Tacitus did well to break his maiden at two. The prestigious Saratoga meeting came a bit too soon, but he did post a trio of works at the “Spa” in July before continuing to limber up at Belmont Park in the fall. 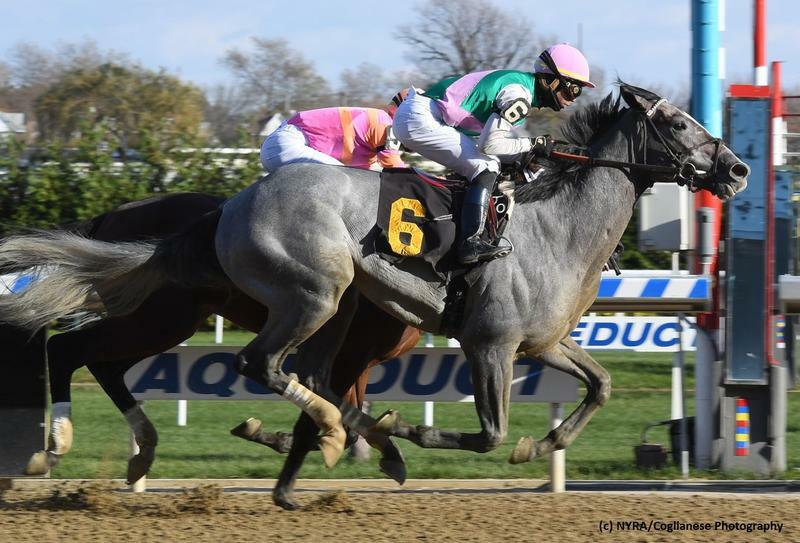 After a fourth in his October 4 premiere, Tacitus stayed on determinedly to prevail next out at Aqueduct November 10, and returned triumphant in the Tampa Bay Derby (G2). His Juddmonte buddy, and stablemate, Hidden Scroll also burst onto the Derby radar this winter. Most recently a tough-trip fourth as the Fountain of Youth (G2) favorite, Hidden Scroll will get another chance to earn his ticket to the Run for the Roses. If both of Juddmonte’s highly rated youngsters make it to the starting gate for Derby 145, it would be a fitting continuation of their intertwining tales.